Garnetics 60 '' - 65 '' universal TV screen protector for television sets is made of a unique material that allows it to 'breathe' whilst keeping out water, sun, dust, heat, mildew, moisture, insects and other elements so you can sit back and relax knowing your TV is protected 365 days a year. 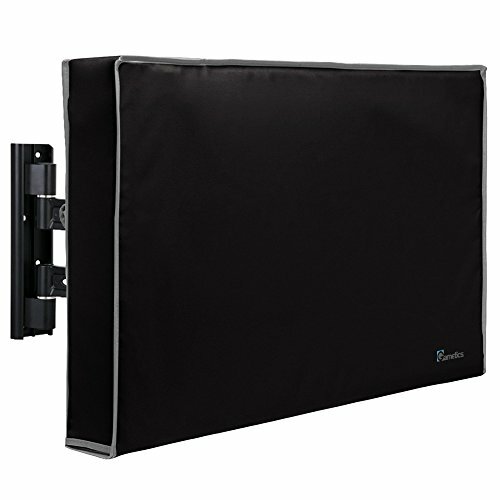 Our 60 " - 65 " outdoor tv cover is compatible with most TV mount and stands with built-in pocket for your remote controller and comes with a unique soft internal fabric (not textile) to prevent scratches. While reinforced stitching means the TV Cover retains that rectangular shape. It not only protects your TV but looks good too. NOTE: TV cover dimensions: 58" W x 37" H x 4.5" D. Please measure carefully the height, width and depth of your television and compare it with the measurements above. DIMENSIONS: 58 " W x 37 " H x 4.5 " D.